Click here for a sample of ANC021. When the brothers Montgolfier began tinkering with their globe aérostatique, they sought to exploit a mystifying physical force they had dubbed "levity." With visions of storming Gibraltar by way of the heavens, Joseph and Étienne saw their fancies realized in a construction of taffeta and cordage. Eventually selecting a sheep and assorted fowl as the first groundlings to rise untethered in the crisp Versaille empyrean only added to the surrealistic fantasia on display one September morning for Louis XVI and an assemblage of his finest sycophants. It was an era new and dreamlike. 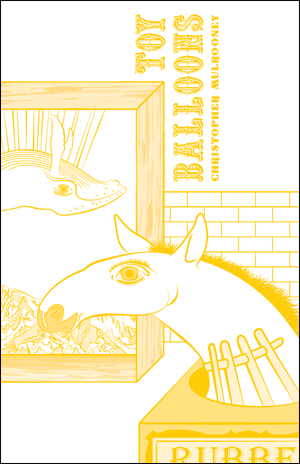 So too are the poems of Christopher Mulrooney fanciful and fresh. Lines dart among the ages, blending the Bard with Drano and the automatic chatter of receipt printouts. These are accounts of Persian manuscript illuminations and wassail bowls, yes, but also Coleman lanterns and yowling puppies. Neither sacred or profane, toy balloons is simply Mulrooney's mind unbound, an Ernst landscape of twinkling fairies riding acorns in an ant train, rocket static voice moon blips, mud and rain and axle grease. ANC021 is out of print.